The hammerhead shark is among the most easily recognizable fish in the ocean due to its unusually-shaped head that gives the fish its name. This shape is officially called a “cephalofoil”. Hammerheads are found all around the world in warm water. Hammerhead sharks can be as small as three feet in length or just over nineteen feet. With their white bellies, they become harder to spot when viewed from the bottom, which allows them an advantage when hunting prey. Speaking of prey, contrary to the majority of sharks the hammerhead is usually seen swimming in large schools during the daylight hours before becoming a solitary hunter at night. Octopus, stingrays, other sharks, and squid are among the dietary items the hammerhead enjoys munching on. 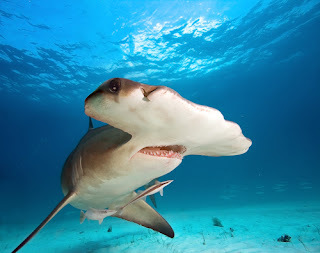 The hammerhead’s cephalofoil is believed to allow the fish enhanced vision. Because of where the eyes are located, the hammerhead can see what’s above and below it at all times. This cephalofoil is particularly useful against stingrays, allowing the hammerhead to pin down its prey.